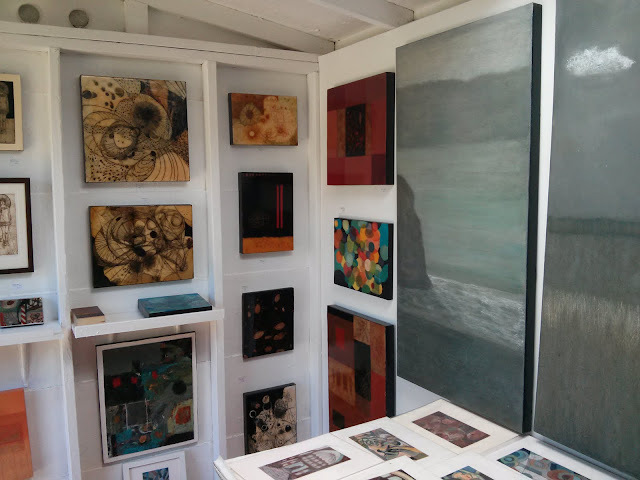 This past weekend and next weekend (June 8-9) are the East Bay Open Studios. This annual event is a great chance to check out art in Oakland and elsewhere in the East Bay. On Saturday K and I walked to an open studio near us (which also happens to be where we vote every election). Sunday after church we had some lunch then walked around some of the open studios near College Avenue. We had a family event to attend in the afternoon but some time before it, so we checked out an open studio between I-580 and Highway 13. There was a variety of media used, ceramics, paints, collages, sculptures, book sculptures; and an even wider range of styles. I liked a lot of what I saw, and we even came home with a few small pieces. Obviously not every piece of art is to everyone's taste, but there are so many different artists participating in this year's open studios that there's something for almost everyone. But as significant as seeing the art was the chance to talk to the artists about it. I highly recommend taking some time and checking out some of the open studios around Oakland, and meet some of your neighbors who are artists.